Garofalo Cappelletti with Rapini and Sausage Recipe - Martelli Foods Inc.
Bring 4 litres of water to a boil in a large pot. Add salt, return to a boil and add pasta. Cooke according to package instructions. 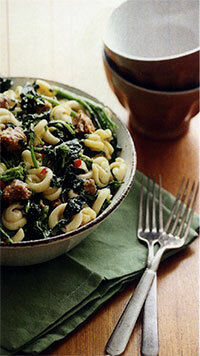 After 3 minutes add rapini to the pasta water as well. Cook all together until pasta is al dente. Reserve 2 ladles of pasta water and then drain.